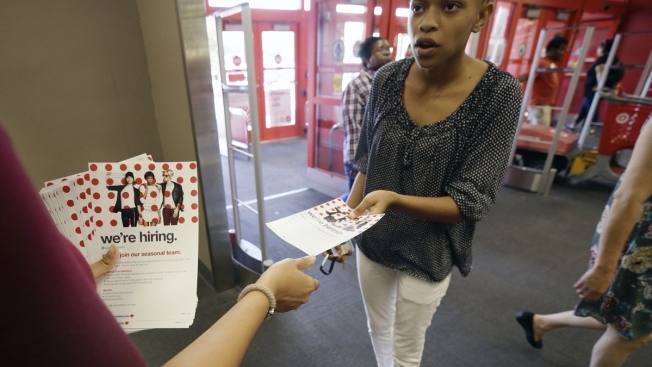 In this Friday, Oct. 13, 2017, photo, a potential job candidate takes a flyer from a human resources representative at a Target store in Dallas. The U.S. government issues the October jobs report, Friday, Nov. 3, 2017. U.S. employers added a solid 261,000 jobs in October in a bounce-back from the hurricanes that slammed the Southeast in September. The unemployment rate declined to 4.1 percent, the lowest in nearly 17 years, from 4.2 percent in September, the Labor Department said Friday. But the drop in the rate occurred mostly because many people stopped looking for work and so were no longer counted as unemployed. October's burst of hiring largely reflects a rebound from the hurricanes that temporarily depressed job gains in September. But it also shows that for all their fury, the storms didn't knock the economy or the job market off course. Over the past three months, job growth has averaged 162,000, similar to the pace of hiring before the hurricanes. Many businesses are struggling to find people to fill open jobs. The proportion of adults who are either working or looking for work fell last month to 62.7 percent, slightly lower than a year ago. Despite a shortfall of workers, average hourly pay rose just 2.4 percent from a year ago, one-half percentage point lower than September's annual gain. That figure might have been distorted by the storms: Many lower-paid workers at restaurants and bars returned to work last month, and their influx could have depressed overall pay. The government also revised up its estimate of the job total for the previous two months. In August, employers added 208,000, up from 169,000. They added just 18,000 in September as thousands of businesses were forced to close. But that figure was revised higher from a previous estimate that showed a loss of 33,000. With September's jobs figure back in the positive column, the economy has now added jobs for 85 straight months, a record streak. The biggest swing in the past two months occurred among restaurants and bars, which shed 98,000 jobs in September. That reflected shutdowns in Texas and Florida after Hurricanes Harvey and Florida. Yet restaurants and bars regained 89,000 jobs last month. Manufacturers added 24,000 jobs. A category that includes mostly higher-paying professional jobs, such as accountants and engineers, added 50,000. Retailers shed 8,300.